This park with recreational fields, grandstands and Lake Henry -- secluded at its western edge -- is owned by Mahwah Township. It is a beautiful, quiet place regularly frequented by waterfowl such as swans, geese, cormorants, and egrets. Ramapo Valley County Reservation and the Darlington Schoolhouse, headquarters for the Trail Conference, are nearby. Curently there is no off-street pathway between Soldiers Field and the Schoolhouse -- a short walk of roughly 600 feet is required along Ramapo Valley Road over a narrow bridge with potentially quick-moving traffic. In back of the playing fields is a little known lake with a mile-long flat circular pathway around it, complete with two broad bridges over the Ramapo River. The hike is just long enough to clear a head or reduce blood pressure. Use the Web Map link on this site to view a map of the larger area including the (un-blazed) trail in this park. To extend the hike, an open field at the northern edge of the lake goes to another informal parking area at Halifax Road, which leads to a mowed path paralleling the Ramapo River. At the main parking area, a walk around the perimeter of the playing fields adds 1/3 mile. After heavy rains sections of the pathway can become very muddy. Click to read a detailed description of a hike. Click to view compelling photos taken in the park in late summer. A Short Line bus runs from the 42nd Street Port Authority Bus Terminal in NYC to Ramapo College in Mahwah, just across Ramapo Valley Road near the park. I've explored for a similar path in the past -- but to no avail. There is a tantalizingly wide path [although now becoming overgrown] heading south near the southeastern end of Lake Henry. It dead-ends at a stream running towards the Ramapo River. Maybe it's for the best since The Reservation is so heavily used, and Lake Henry remains blissfully isolated. 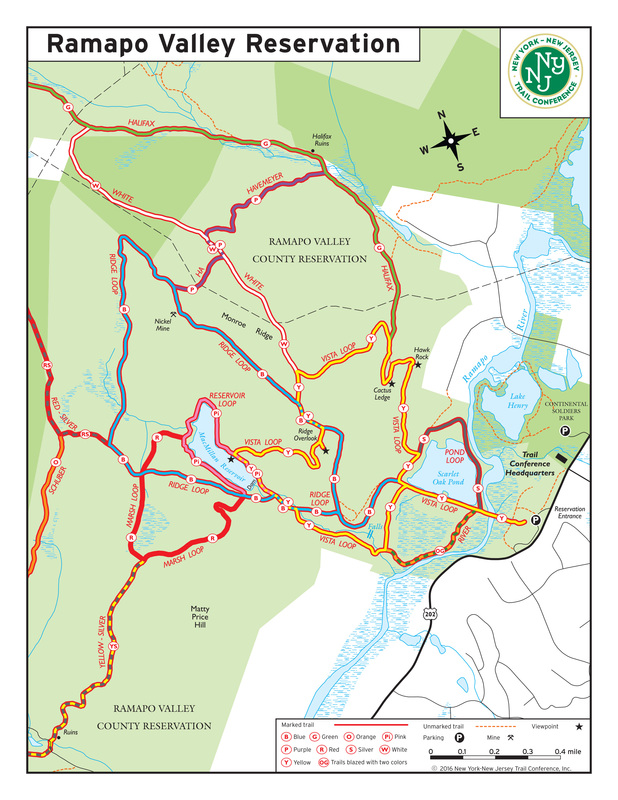 Is there a path that leads from Continental Soldiers Park to Ramapo Valley County Reservation? The 2 bridges on the path around Lake Henry don't actually cross the main Ramapo river but the inlet and outlet of the lake. It looks like there should be a way (Scarlet Oak Pond is so close) but when I looked around the other day I could not find a way across the Ramapo river. Thanks. This trail makes for a nice little run.. it has about two rolling hills as well. Right now its quite muddy though.